The MRP G2 SL Chainguide is a light and tough single ring guide that was designed for ease of installation, especially on Nomad carbon. Converting 2x10 dual chainguide to 1x10 single chainguide makes hell lots of difference in terms of weight saving and bike handling. My Nomad carbon was drastically trimmed from 32.14 lbs to 30.84 lbs, a significant 1.3 lbs (0.58 kg). Getting rid of the granny ring might not be a shortcoming. The weight saving for doing without the granny may well equalize the efficiency in climbing. Obviously you need to remove the crank. 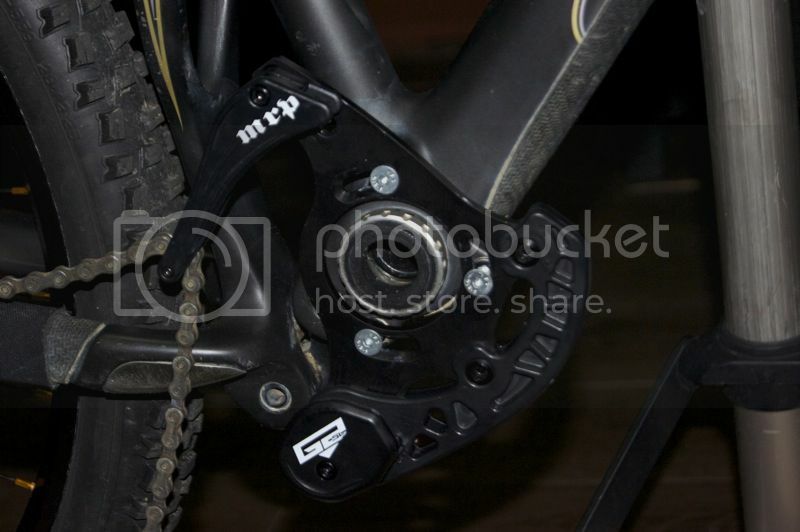 For ISCG05 mount, you need not remove the BB as the MRP G2 SL plate can be mounted directly onto the frame. 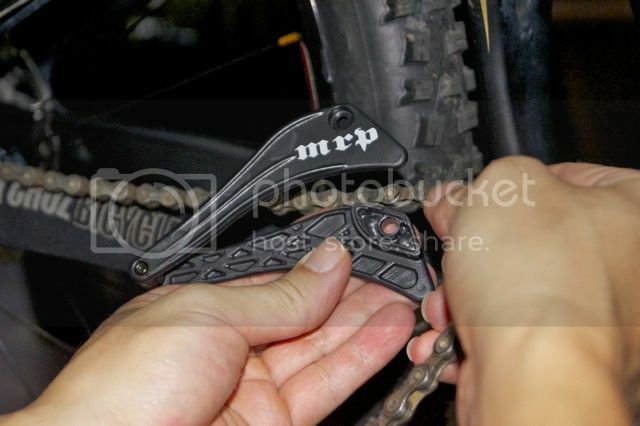 Clean it thoroughly before you mount the MRP G2 SL chainguide. This is how the ISCG05 mount looks like after the crank was removed. You need not break the chain to install the chainguide, this was the beauty of MRP G2 SL chainguide. Just remove the MRP derailleur cage from the plate; open the derailleur; slot the chain into the cage; and close the derailleur. The MRP G2 SL chainguide was supplied with two different length of bolts and different thickness of spacers. Chose the longest possible bolts that will fit your bike frame for better holding. Put the spacers in between the Nomad frame and MRP plate if needed in order to align the chainline with the coge. At this stage, do not tighten the bolts, and let it hang loose so that the MRP assembly can be adjusted later. 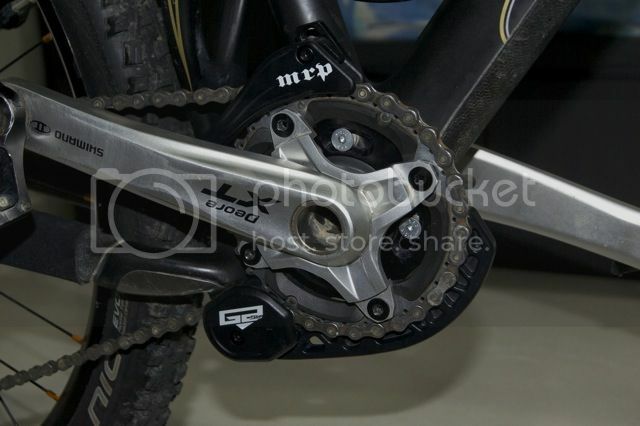 This is how the MRP G2 SL chainguide looks like after it was installed onto the frame. The plate should be able to rotate freely. 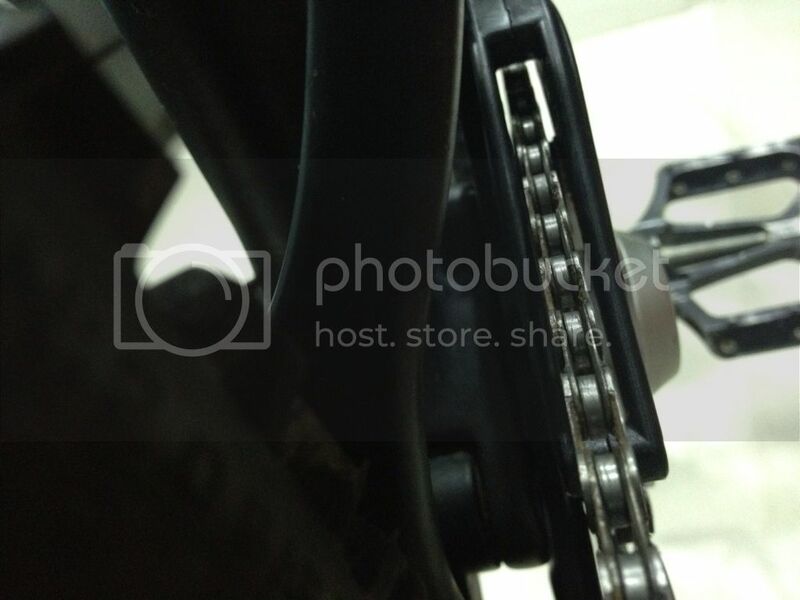 Both the derailleur cage and the chainguide can be adjusted to accommodate the size of the ring. As I am using the micro version, the adjustable range is 32T to 36T. 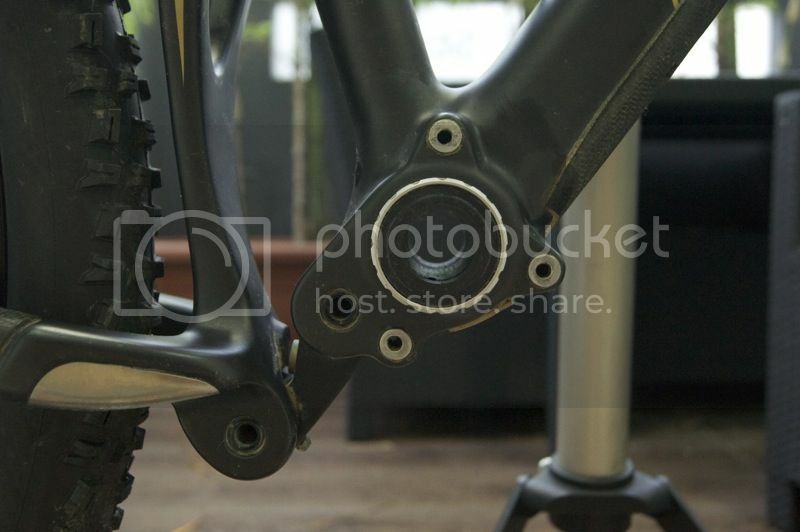 Insert the crank into the BB. Sling the chain over the ring and adjust the chainguide to accommodate the chain. 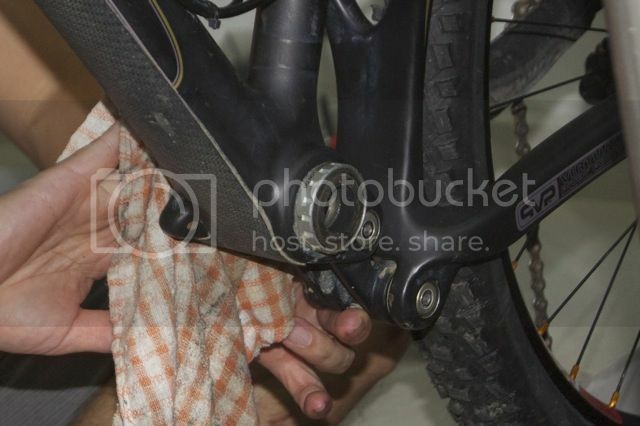 Rest the bike on the ground to get the correct clearance between the chainguide and the Nomad rear arm. Adjust the chainguide to the appropriate position (E.g.32T). Rotate the MRP G2 SL chainguide assembly so that the chainguide just about to touch the Nomad rear arm. Tighten the 3 bolts that secure the MRP G2 SL assembly. 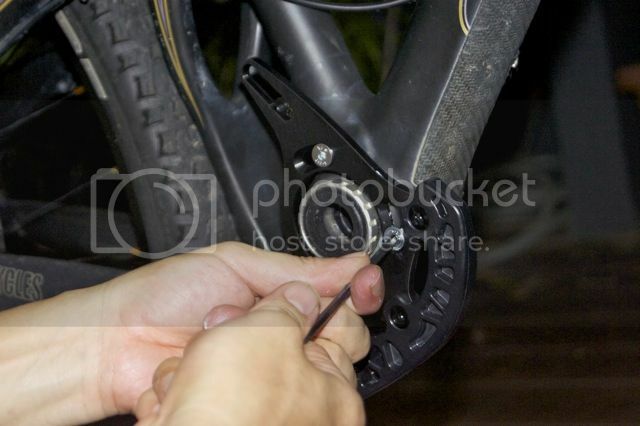 Adjust the MRP derailleur cage and ensure that the chain seats nicely along the center of the cage. If there was excessive rubbing of chain on the inside of the derailleur as you rotate the crank, you may need to add or remove the spacers that seat in between the Nomad frame and the MRP G2 SL plate in order to achieve the correct chainline. 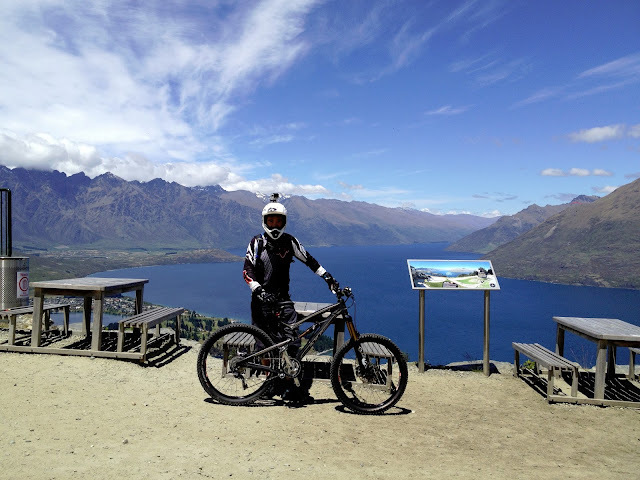 Next, test ride the bike at the carpark or your backyard - DO NOT hit the forest straight away. Play with all the gears, hop as many times as possible, and run over stones and small drops with the intention to shake off the chain from the ring. Hit the forest only when you are satisfied with the test ride.